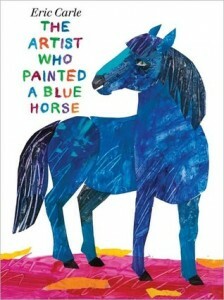 The Artist Who Painted a Blue Horse is one of the most stunning children’s books I have ever seen. The author, is Eric Carle, you may recognise him from one of his previous books being The Hungry Caterpillar. I remember this as a child, it was one of my favourites when I was very young, so it was one I introduced to my children when they were very young. When I heard about this book I had to get it. This is his first brand new picture book in four years. The Artist Who Painted a Blue Horse is about an artist who paints beautiful animals painting in bright, vibrant colours, but colours which are not associated with the animals from a polka dot donkey to a green lion, from a black polar bear to a red crocodile to name a few. In this book Eric pays tribute to Blue Rider (Blaue Reiter) Painter Franz Marc (1880-1916), he creates these wonderful illustrations based on Marc’s work, to celebrate it. The boys loved this book, the story is simple but the colourful images bring the book alive. It encourages them to ask questions and it’s great for asking the younger one what each colour is and which animal it is. I would highly recommend this to anyone with young children, it is a perfect way to introduce them to colours, animals and creativity. It is a wonderful read and is simply beautiful to look at. This would make a perfect gift to anyone with a child.